The Buses of Malta and the small island of Gozo have always held a deep affection for the British bus enthusiast. Over the years many British buses have been exported to the islands in both new and used forms. All this will change in 2011 when the large, now German owned Arriva company takes over the running of the vehicles and routes. Many old favourites will go, to be replaced by modern air conditioned low floor buses. To capture the old order the independent transport videos cameras returned in the summer of 2010 to make a comprehensive visit to Malta and Gozo to make a film before everything changes for good. There is so much to see we have had to put it all on two discs! Part one covers Malta, and part two we start in Gozo and return to Malta. Our review starts with the first of four visits to the busy City Gate bus station in the grand city of Valletta, Malta’s capital. This, a morning visit shows off the breathtaking variety of vehicles, from ‘normal control’ buses built in the mid 20th century, to Duple and Plaxton coaches from the 1970’s, Bristol LHs, Dodges, Ford Thames to the new King Longs, not to mention former Swindon and Thamesdown ECW bodied open top Leyland Fleetlines, the list goes on! From Valletta we follow the action of these fine vehicles in Mellieha, Ghadira Beach, Birzebbuga and Rabat. In Rabat we come across former Northampton Corporation Daimler CVG6, with a Roe body, now open top operating in City Sightseeing livery as well as a fine mixture of young and old vehicles! After an afternoon return visit to the bus station in Valletta we climb aboard a beautiful Ford Thames ET7 with Micallef B36F body dating from the early 1950’s (EBY 537). This normal control bus takes us on the Sliema Circular route with excellent views, sounds and atmosphere that brings part one of this programme to a close. The short ferry ride is captured as we land at Gozo and start filming in the bus station in Victoria – the capital of Gozo. 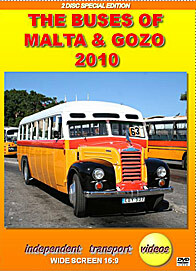 Like Malta there is a great variety of buses for you to enjoy. The double deckers on Gozo are open top ECW Fleetlines and brand new Optare Scanias. We take a ride on FBY 021 a 1953 Ford ET7 from Mgarr to Victoria for more filming in the bus station. Our final location on Gozo is at Marsalforn before the ferry back to Malta. Filming continues at Sliema, St. Julian's, Paceville, Sliema Ferries, Marsaxlokk, Mosta, Vittoriosa and Marsaskala as well as two more visits to Valletta’s City Gate bus station. This will also be moving when the new order takes over. So sit back and enjoy the sights and sounds that will soon be consigned to the history books. Duration : 171 minutes (approx).